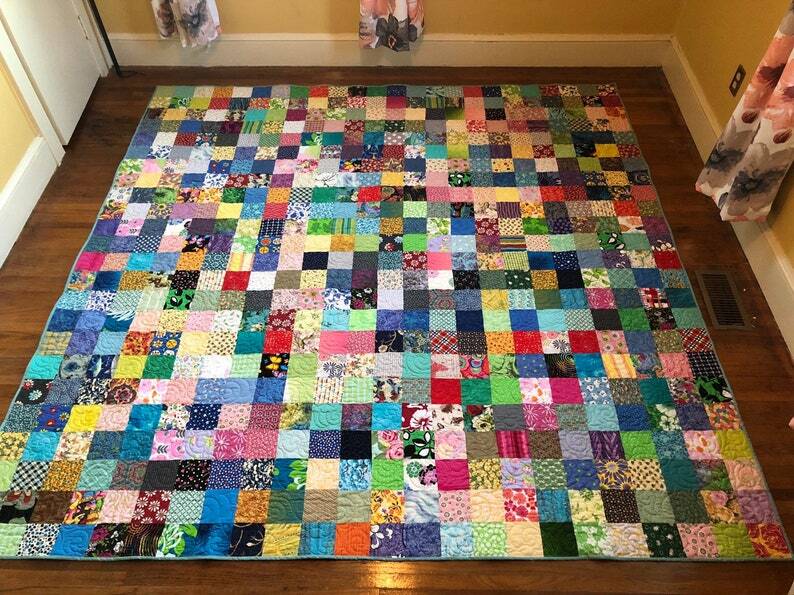 Beautiful spring colors make this queen size patchwork quilt so inviting! Quilt is made of 4 inch squares of quality new fabric. The batting is a cotton blend and the backing is a lovely beige with white flowers. I professionally quilted this beautiful quilt in a swirl pattern. The binding is attached by machine and is a muted shade of green. Quilt measures 94" X94". It is ready-to-ship. Care instructions: Quilt should be washed on Delicate cycle and Tumble Dry Low heat or hung to dry. Thank you for visiting Quilts Modern-traditional quilts made the modern way! This is the 4th quilt made in 2019. We named it Debbie.